Private collection, Steeple Aston, Oxfordshire, England; art market, Brighton; purchased 1973 by (Michael Hall Fine Arts, New York); purchased 25 February 1974 by NGA. Recent Acquisitions and Promised Gifts: Sculpture, Drawings, Prints, National Gallery of Art, Washington, D.C., 1974, no. IV, repro., as by Giovanni Battista Foggini. The Twilight of the Medici: Late Baroque Art in Florence 1670-1743, Detroit Institute of Arts; Palazzo Strozzi, Florence, Italy, 1974, no. 298. The Bronze Figure in Italy, Museum of Fine Arts, St. Petersburg, Florida; J.B. Speed Museum, Louisville, 1981, no. 27. Draper, James David. 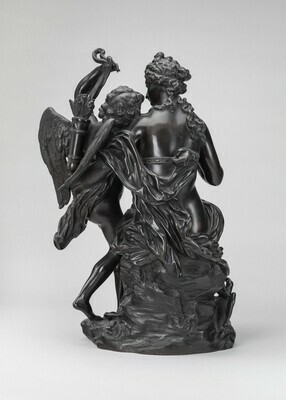 "Giuseppe Piamontini's 'Amore in Braccio a Venere'." Antichità vita 13, no. 6: 44-45, fig. 3. Bellesi, Sandro. “L’antico e i virtuosismi tardobarocchi nell’opera di Giuseppe Piamontini.” Paragone 42 no. 497 (1991): 21-38, esp. 29, 31; repro fig. 46. Sculpture: An Illustrated Catalogue. National Gallery of Art, Washington, 1994: 173, repro. Fogelman, Peggy, and Peter Fusco, with Marietta Cambareri. Italian and Spanish Sculpture. Catalogue of the J. Paul Getty Museum Collection. Los Angeles, 2003: 244, 248 n. 5. Orsi, Carlo. Giuseppe Piamontini: "Il Sacrificio di Isacco" di Anna Maria Luisa de' Medici, Elettrice Palatina. Milan, 2005: 50-52, fig. 35. Bellesi, Sandro. I marmi di Giuseppe Piamontini. Florence, 2008: 63. Brillos en Bronce: Colecciones de Reyes, exh. cat., Patrimonio Nacional, Palacio de Oriente, Madrid, 2009-2010, Madrid, 2009: 204.